Jackie Chan and Chris Tucker return for Rush Hour 3 . The Skinny: Jackie Chan and Chris Tucker are back! But is that a good thing? While our two Rush Hour heroes travel to Paris for some amusing hijinks and martial arts action, the final product doesn't amount to anything even approaching the genuine fun of the first two films. When it comes to big-screen comedies, it's never a good sign when the outtakes are funnier than most of the jokes in the actual film. And while the Rush Hour franchise is well-known for its often hilarious bloopers - most notably Chris Tucker's seemingly life-or-death struggle with the English language - the "NG footage" of these flicks always felt like a tasty dessert that completed an already satisfying meal. As funny as they might be, the outtakes were never meant to be the main course. The filmmakers behind Rush Hour 3 probably didn't intend for the bloopers to be the funniest thing about the movie, but that's pretty much what happened. As an unabashed fan of the popular Jackie Chan/Chris Tucker "buddy cop" series, I am pained to report that Rush Hour 3, while certainly amusing at times, falters considerably in comparison with the first two installments of the series. Story-wise, Rush Hour 3 picks up three years after the events of the second film. While Detective James Carter (Chris Tucker) has been demoted to traffic cop, Detective Lee (Jackie Chan) is working as a bodyguard for Ambassador Han (Tzi Ma, reprising his role from the first film). While speaking at the World Criminal Court, Han is shot, and Lee chases after the gunman, only to discover that the would-be killer is Kenji (Hiroyuki Sanada), a man with connections to his own past. Eager to help his old friend, Carter blunders his way through a rescue attempt and gets himself embroiled in the action. Han survives the assassination attempt, and his now grown-up daughter Soo Young (now played by Zhang Jingchu) makes her old pals Carter and Lee vow to catch her father's shooter. In order to do that, however, the two mismatched pals have to discover an ancient Chinese MacGuffin that will unravel the secrets of Chinese Triad society and put a whole lot of criminals behind bars. Or something. Don't think about it too much. In any case, Carter and Lee end up in Paris, but not without getting into plenty of trouble. As you might've guessed, hijinks aplenty ensue. But is the third time the charm? Whereas the first Rush Hour had Lee playing the fish out of water in Los Angeles, and the second had Carter completely out of his depth in Hong Kong, this third film takes the next logical step in using the Paris locale to turn both of its lead characters into outsiders. Unfortunately, that move doesn't really lend itself to the same sort of humorous cross-cultural confusion as it did in the previous films, as Rush Hour 3 pretty much relies on the same tired jokes at the expense of the French rather than forging any genuinely amusing observations about the two detectives' respective feelings of culture shock. For most fans of the series, it was the unlikely chemistry between Chan and Tucker that drew them to the theaters, and Rush Hour 3 certainly does try to take advantage of the audience's goodwill toward the characters. Although there is some conflict that emerges between the two (a throwaway spat involving Lee's ex-girlfriend), the filmmakers don't spend too much time dwelling on it. When the script calls for Lee and Carter to have a falling out that feels patently manufactured to begin with, director Brett Ratner and company play around with the sheer obviousness of this cliché by employing a purposely funny "sad montage" for a few laughs. There is an assuredness to this film that is at once comfortable and lazy, but more on that later. One problem with Rush Hour 3 is that both Carter and Lee (and perhaps Tucker and Chan themselves) are starting to show their age. That's not a comment on their looks (although there has been a noticeable change in the six years since Rush Hour 2); it's more an issue of energy level. For instance, the motor-mouthed Carter isn't nearly as funny as he used to be. While Tucker would often spout off nonsensical or just plain ignorant remarks throughout the previous films, there was a real crackle to his remarks that would punctuate the tension in a scene at just the right moment. Here, however, the jokes - while somehow amusing - elicit more groans than they do actual belly laughs. Whether screenwriter Jeff Nathanson, Ratner, or Tucker himself is to blame is unclear, but the sheer laziness of the humor is certainly disappointing, Still, even as I complain about the jokes, I can't help but admit that there are a few gems, including Tucker's panicked, suitably mortified cry: "I'm Brokeback Carter." Your mileage may vary. There's really nothing bad one can say about Jackie Chan. Detective Lee is pretty much the epitome of the image Chan has cultivated in the West - the honest and completely earnest hero who can remain loveably innocent in the audience's eyes even when he recommends buying a dirty movie ("Only 9.95!"). It's a role Chan has played before in other films, but one can't fault a man for doing what he does best. Of course, what Chan really does best is death-defying stunts, but those days, alas, are clearly over. Action-wise, Rush Hour 3 boasts a few crazy action sequences, but it's more about the skills of the stuntman surrounding Chan than it is about the man himself - although he's still a joy to watch. To return for the acting for a moment, it's curious that Detective Lee's subplot involving Hiroyuki Sanada's character actually works. In their scenes together, the two actors add a surprising emotional core to a relationship that is a) thrust upon the viewer in the first act and b) is otherwise barely developed. It's in these moments that one may catch themselves thinking that Chan and Sanada have somehow got their hands on a script for a much better movie than Rush Hour 3. 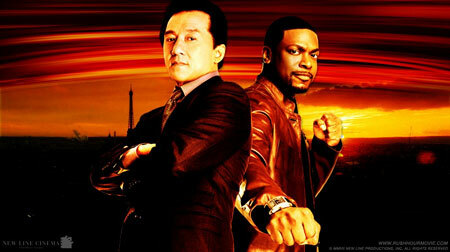 As a sequel, Rush Hour 3 seems to have all the right ingredients, at least, on paper. In a welcome nod to continuity, it references previous films in the series, as a number of call-backs to jokes from parts one and two come into play throughout the film. Even Rush Hour 2's Isabella (Roselyn Sanchez) gets referenced, although the strange cruelty in the way in which her character is dealt with makes one wonder why she needed to be mentioned in the first place. But still, the inclusion of Tzi Ma as Consul Han, the likeable Zhang Jingchu as the grown up Soo Young, and even Philip Baker Hall as Carter's superior gives the series a kind of cohesion that one would hope from a trilogy - even one as unlikely as the Rush Hour films. All that continuity would help make a richer sequel if it weren't for two major problems. One, the movie is dumb. Two, much of the comedy, as mentioned earlier, falls flat. If one has the latter then the former becomes less important. But it's hard not to get a little annoyed that Max Von Sydow is telegraphed as the villain immediately, while the film still maintains the pretense that it's somehow a mystery to the viewers. If the "surprise" is so obvious, why not just let the audience watch the villain do nefarious things? Even worse, characters pop up suddenly in places where there's no possible way they could be there, most notably in the slapped-together finale. It's just lazy storytelling that's excusable when you're having the time of your life, and egregious when you're looking at your watch and wondering when the movie is going to end. When I say that the comedy "falls flat" that is perhaps too harsh. It's amusing at times. But that's usually all it is. The film just seems like so much wasted potential. Carter and Lee's fight against the Chinese Kareem Abdul-Jabbar, the interrogation of a villain using a French-speaking nun, Roman Polanski's cameo as an overzealous French cop, and the anti-American (Yvan Attall) cabbie who soon finds himself reveling in American action movie excess - all comic set pieces have the earmarks of classic comedy bits (or at the very least a tremendously funny skit), but they all just seem to miss the mark. They give just enough to elicit a grin, but not much more.